regarding your Burton Step On® products. The Heel Cleat component found on all Burton Step On® boots features two levels of connection with two different engagement positions. Position 1 is designed to accommodate for underfoot snowpack. The final heel engagement position, Position 2, is the optimal and most common riding position. We’ve discovered a possible issue in which the Heel Cleat of Burton Step On boots (2017/2018 season model) may not properly engage when in Position 1. While this only affects the functionality of Position 1, we strongly advise an immediate update to the Heel Cleat on your Step On boots. 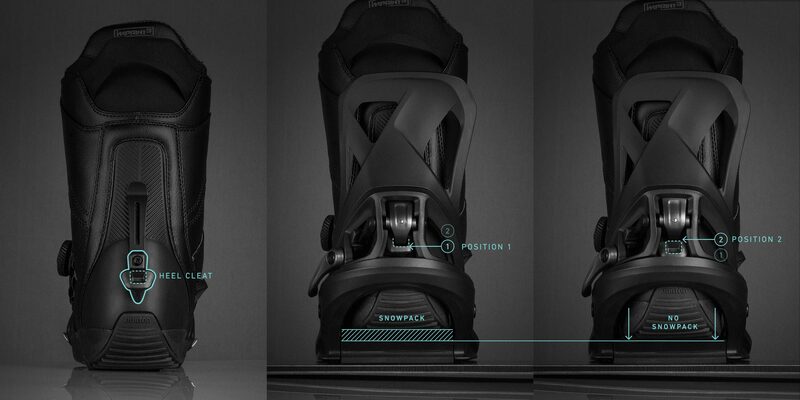 Until this update has been made, please ride with the Heel Cleat engaged in Position 2. NOTE: All updated heel cleats feature a white square around the screw. Please watch the video below on how to identify the correct cleat. If yours do not feature the white square, please follow the instructions on this page to get your updated heel cleat. Installation is easy. Learn more in this helpful how-to. Submit your information here and we'll send your parts out to you. You can also pick them up at your nearest Burton Flagship Store or Step On Authorized Dealer. Your order has been submitted. We will notify you when your order has shipped. This order is for one pair of updated parts. Please submit again for each additional pair needed. Sorry, there was an error with your submission. Reload the page and try again. Don’t feel comfortable doing it yourself? Bring your Step On boots to your nearest Burton Flagship Store or Step On Authorized Dealer. Send your Step On boots to us. Call Burton Rider Service - (02) 9935-9000 to get your free expedited shipping label.